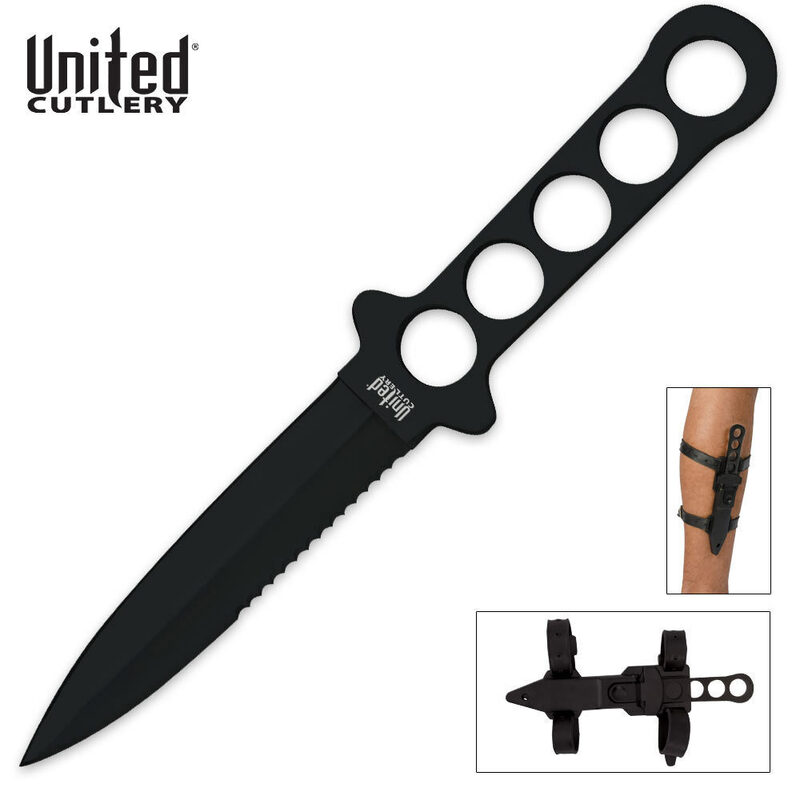 United Cutlery Stingray Dive Knife Black & Sheath | BUDK.com - Knives & Swords At The Lowest Prices! If you are searching for the best dive knife available, then look no further than this Sting Ray dive knife from United Cutlery. Constructed of one piece of solid, black-coated AUS-6 stainless steel, the half-serrated blade offers a slotted handle for a secure grip with a lightweight feel. The partially serrated blade provides the ability to quickly saw through almost anything you may encounter. Includes a black impact-resistant ABS sheath with a quick-release mechanism for fast, easy accessibility in life-threatening situations. A water drain hole allows excess water to drain off the knife quickly to prevent corrosion. Can be worn with rubber arm/leg straps or on a belt. i don't know about diving but i think this is an underrated knife for concealed carry when your primary goal is concealed and your 2ndary goal is access, iow you can wear this upside-down on your calf and it is undetected; but when you need it it will require 2 hands one to push the lever through your pants the other to pull it out; but the primary deal with carrying a weapon is THAT IT IS THERE, if it's left in your car or home it does you no good. as for the straps the rubber works fine but if you want more comfort google "velcro elastic strap" there are many to choose from. This thing is great! It's actually good for throwing, and it looks really cool. It's sharp and very sturdy. I like the look of the knife its self and at first glance the sheath is pretty good too. then i tried it on...For those of you with thick calves and hairy legs...do your self a favor...dont...just...dont. the rubber stap only grips when you try to pull it higher on your leg but when putting the knife in the sheath it slips right down, pulling hair both ways. The lock really locks it in which is nice but why a push button? that makes it difficult if you're in a hurry to pull it out. would have been better with a molded lock instead of a mechanical one. As for the knife its not that sharp, other than the serrations. Thats the only bad thing i see about it. Absolutely useless DULL AND SOFT piece of metal. Never buy it. Just don't waste your money. Its an awesome knife i love it!! I take it where ever i go,, and i understand that its a underwater knife and thats why the straps are rubber but for people who dont go divin yall should make diffferent straps for it so people can carry it around without it yankin leg hairs lol plus rubber tears and rips but other than that its great! this is a wonderful knife i like the black tint to the knife the straps made of rubber are nice and the sheath holds it in place real nice vary sharp and all around good knife. good knife, came pretty sharp. strap is good as well, can open with one hand once strapped. The best knife I have ever Owned in my life its perfect !